The Umbra Flip wall mount multi-hook unit boasts a clever design - the wooden rack features 5 hooks that flip up and down. When not in use, each hook slips neatly into the rack for a sleek, space-saving look. Constructed of hardwood with brushed nickel-plated hooks; available in White, Natural and Espresso finishes. Unit measures 1 x 3 x 20 inches overall. Mounting hardware is included. 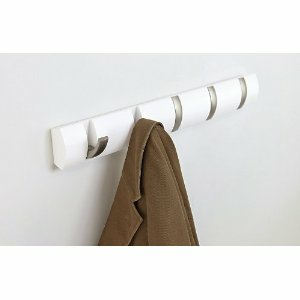 Designed by David Quan for Umbra - a worldwide leader in casual, contemporary and affordable design for the home.